Teenage E books available online - Recommended reading age 13 years plus. "Follow Anastasia's further adventures in Anastasia Series III Omnibus. This is a set of all 9 short stories from Anastasia Series III in one handy eBook. Anastasia is now a teenager with big issues of her own and has to come to terms with her illness. She has decided she can no longer stand back and watch some of the world’s worst criminals get away with their crimes. The training begins and a new Anastasia is the outcome. Taking on the world of trafficking, Anastasia goes in undercover, with guns blazing, to put an end to some of the worst crimes around the world. Along the way she learns more of her heritage and meets some very important new people. Series III is full of action, adventure, history and an insight into the worlds of people and drug trafficking. Join the teenage detective on her new adventures. Series III is aimed at teenagers and young adults due to the content of the stories. Enjoy the journey... "
Join Anastasia in her new adventures as a teenage detective. Will Anastasia's new friends help her to rescue the two, kidnapped children? A secret is discovered that has been kept hidden for decades. Getting over the news of who her parents were Anastasia faces a most dangerous mission Anastasia learns of her fate and does her utmost to keep this information to herself. Anastasia goes on a journey to the Emerald Isle Anastasia is still in Ireland, the Emerald Isle, to attend her first horse auctions. Can the teenager and her army outsmart the Poderoso cartel in Colombia? 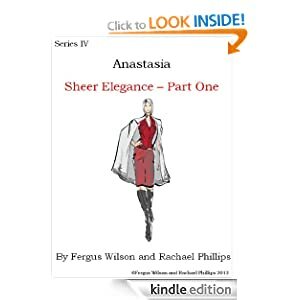 This is a set of all 9 short stories from Anastasia Series III in one handy eBook.